I am a brand ambassador for At Home Stores and this post is sponsored. All thoughts and opinions are my own. 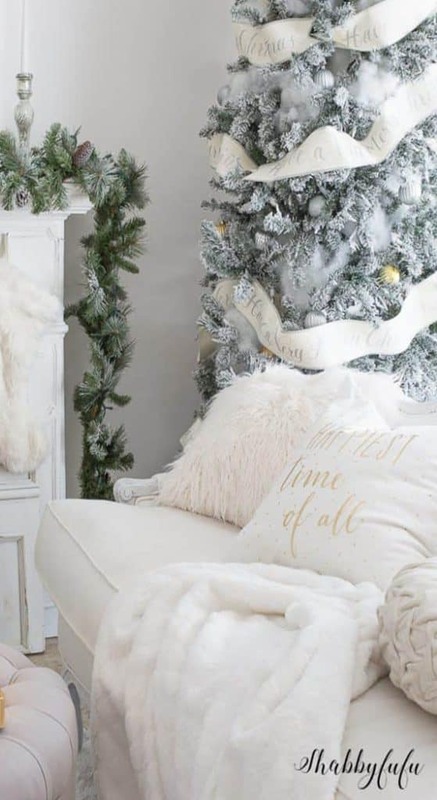 I’ll admit…I just love decorating and designing rooms for the seasons and Christmas offers so many possibilities that it’s hands down my very favorite! 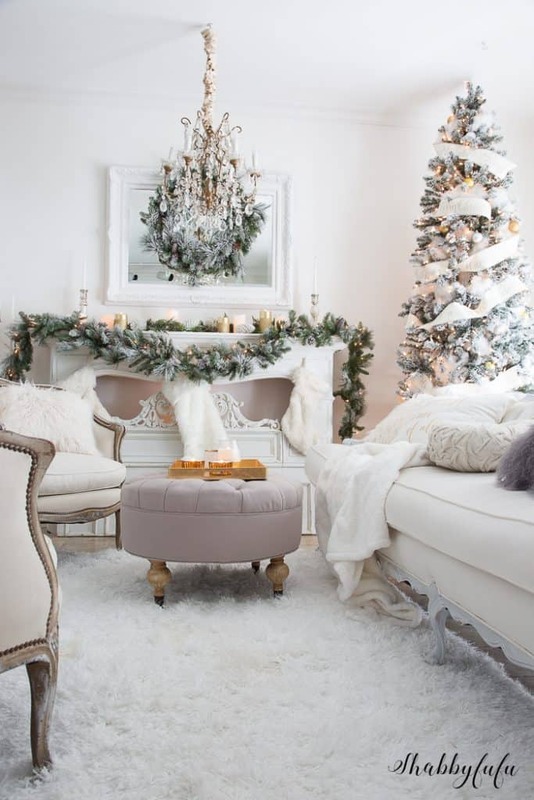 Today I’m sharing my living room done in a snowy elegant and simple white theme and that’s how I get the feeling of it being cold outside baby, even though I live in South Florida where snow would be an anomaly. I’m sitting in the air conditioned comfort of this room as I pen the post today…and it’s probably one of my favorite Christmas looks to date in here! Let me give you a few tips on this elegant Christmas look! In my living room I start with the focal point of the room, which in this case is the mantel. 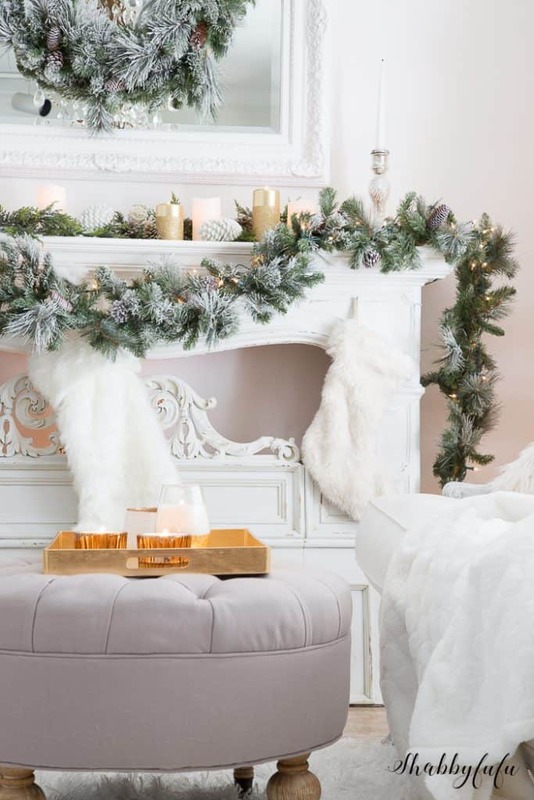 No…we don’t have a real fireplace, so there are never worries about anything catching fire! 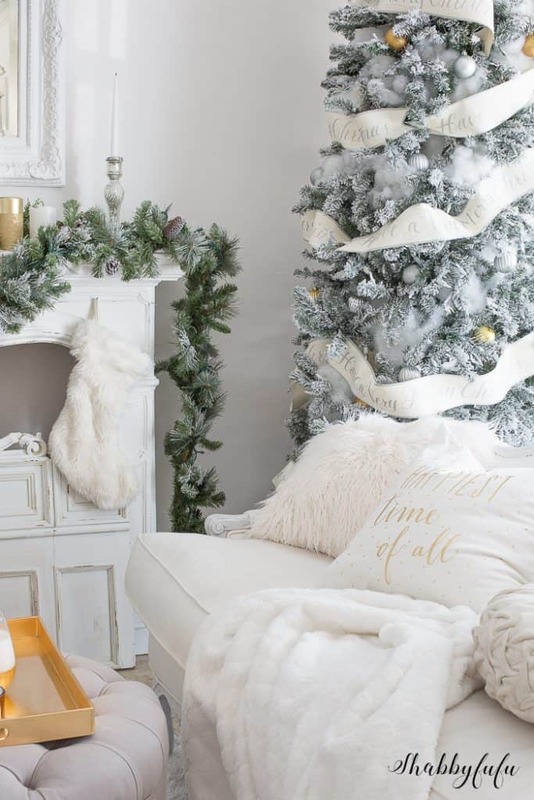 I knew that I didn’t want a totally white look, so I went with flocked pieces and for the fireplace I laid down two FROST MIXED GARLANDS and hooked them together in the center. 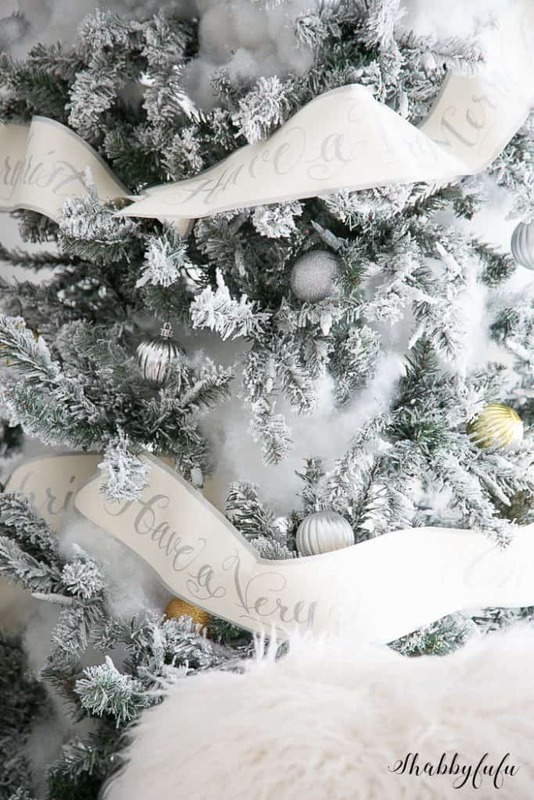 The garlands have natural pinecones in them that are also kissed with some frost and then I added a long string of white lights. 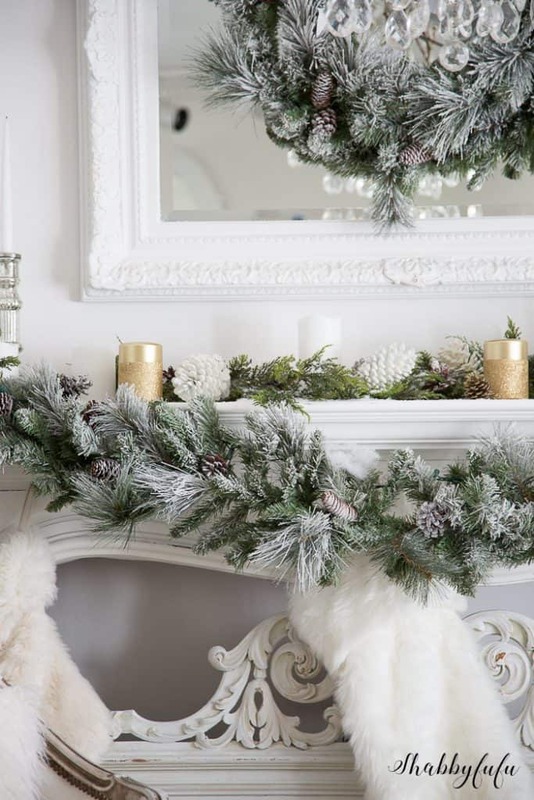 I love to have my garlands pinned at each side and drape loosely in the middle. 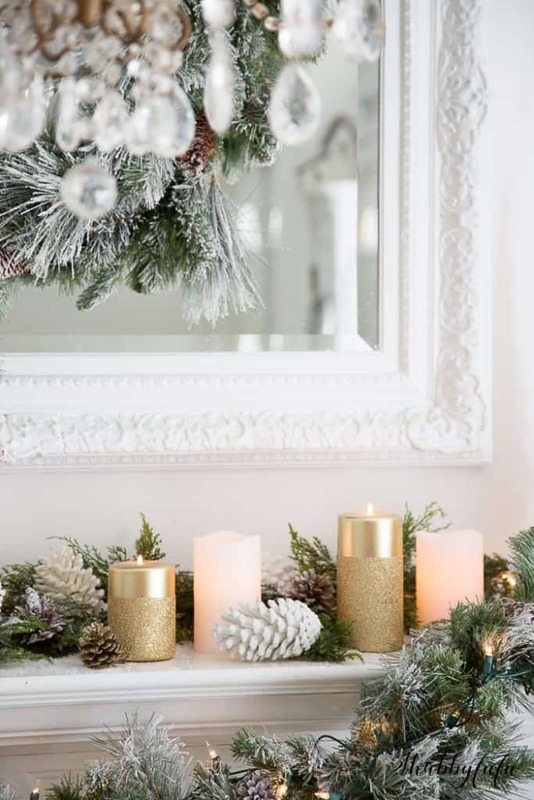 On the mantel shelf itself are some faux cedar and juniper, pinecones that I’ve picked up on my walks, white pinecones, WHITE LED CANDLES, mercury glass candlesticks and GOLD GLITTER PILLAR CANDLES. It looks snowy and ethereal during daylight hours and when night rolls around and everything is lit it has a beautiful glow. 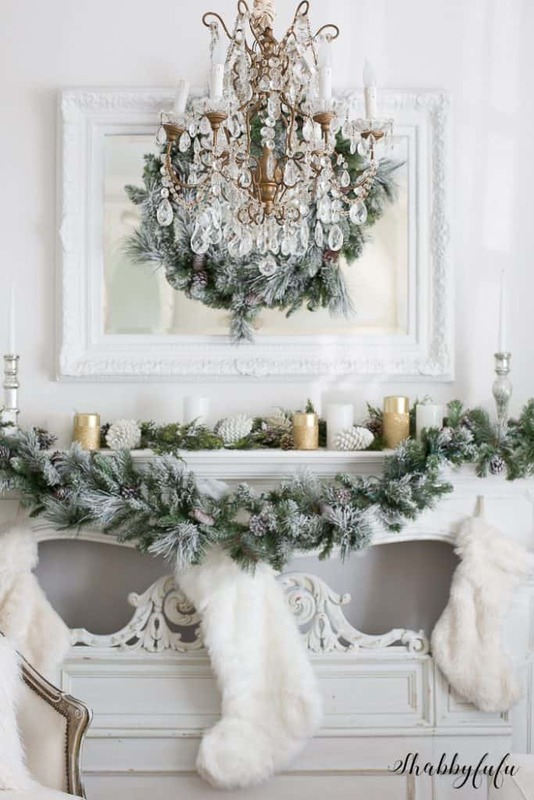 Hanging over the mirror is maybe my favorite of this year’s CHRISTMAS DECOR…a 30″ WHITE FROSTED WREATH. 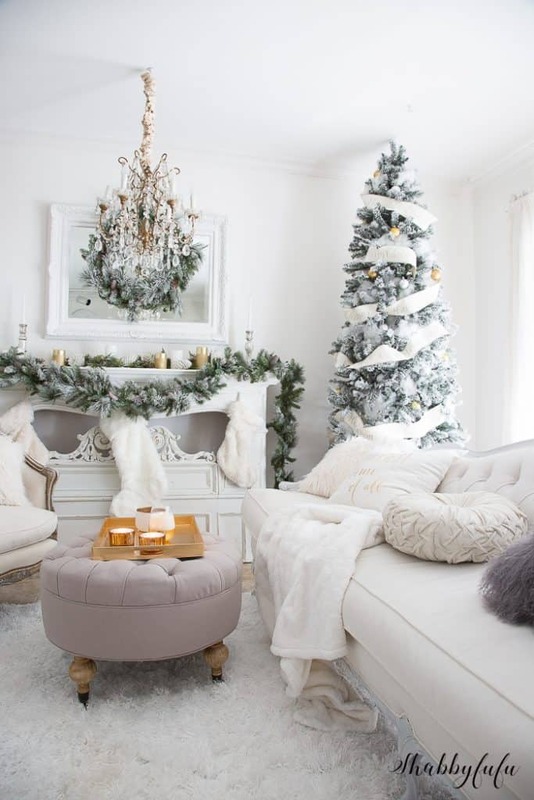 The 9′ FLOCKED TREE is just STUNNING and if you have a tall ceiling (as I do in this room) but a narrow space it’s perfect. It’s not a pencil tree, just narrower than some of the others that I’ve seen out there. 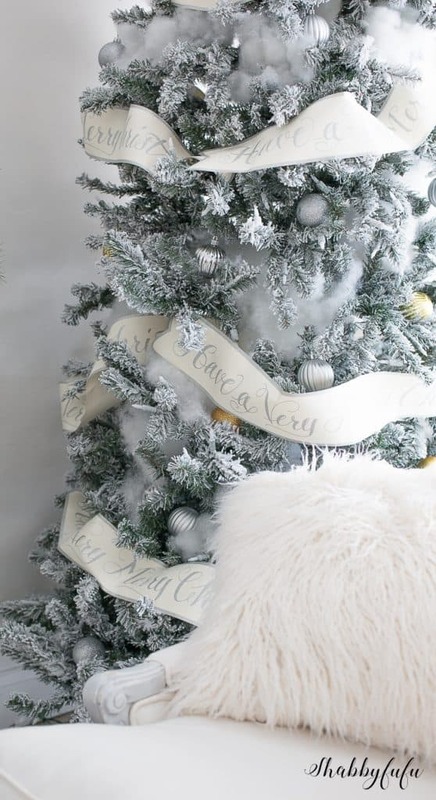 I’ve trimmed the tree sparingly…nothing over the top, with SILVER and GOLD shatterproof ornaments. I’ve only recently begun using shatterproof and I have to tell you that with 3 rambunctious dogs doing laps, they are such a great thing! 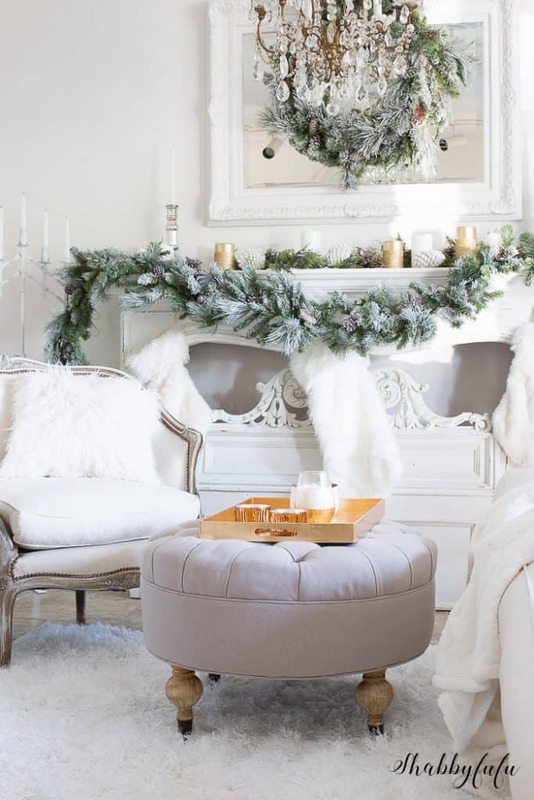 My home has a Frenchy feel…and the fireplace screen is a vintage headboard that we cut down to the right size. I painted it and distressed it lightly and you can see some pops of the old gilt gold finish popping through. 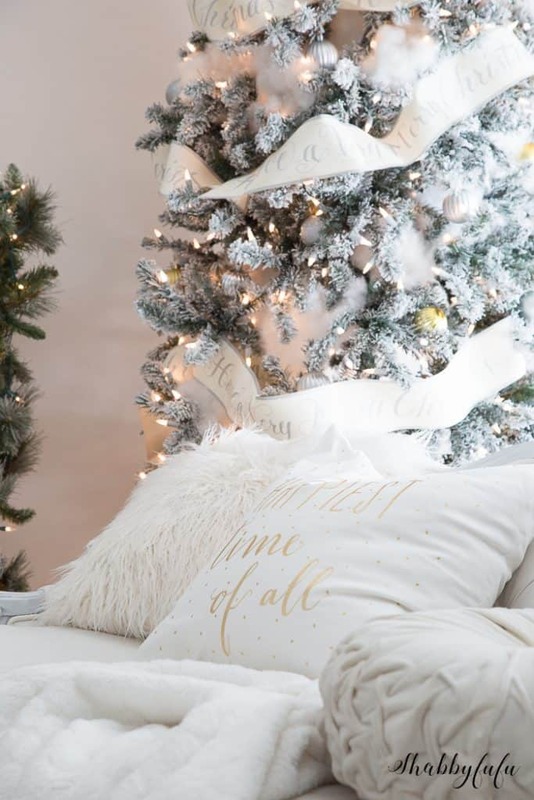 The lights are turned on now and give the room a golden glow, and since I’m crushing on MIXING METALLICS it’s just perfect. Scent is so important as one of the senses, so I have a few Christmas candles on hand at all times during the holiday season. I hope that you enjoyed the tour today, and if you have any questions feel free to comment and ask! 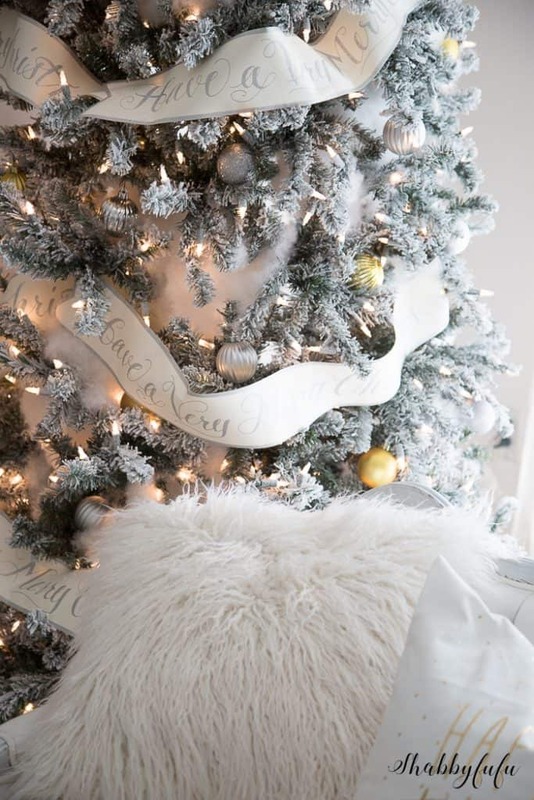 I’m sharing this post as part of the Home For The Holidays Tour with the bHome bloggers, so please visit these inspiring bloggers as well!